The Creative Nonfiction author expands the unknown story surrounding real verifiable facts. The result can be humorous or sobering. It can be imaginative and informative . . . and often agenda driven. When writing the Odyssey, Homer may have expanded what was known, or assumed, into a fantastical and entertaining tale that has survived the ages. Think of tabloid newspapers today. A grain of truth is often expanded into a complex, yet fictitious, story. The science includes real plants. 1. Select a factual story. It can be science related. 2. Expand your story into a creative nonfiction tale of fantasy suitable for entertaining friends around a campfire. 3. 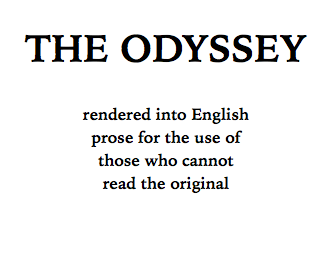 Look at the Odyssey on Gutenberg here. 3. Check out Creative Nonfiction publications: Creative Nonfiction links from unm.edu.